Felix Millan’s choked-up batting stance and dazzling glovework at second base are deeply entrenched in the minds of baseball fans that saw him play in the 1960s and 1970s. 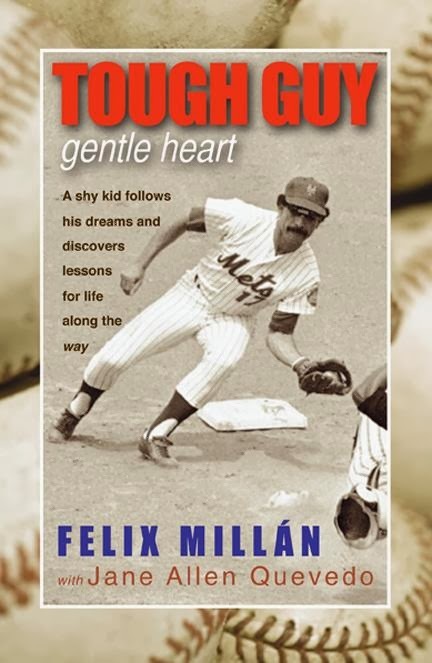 Now well removed from his final play on the field, Millan has partnered with author Jane Allen Quevedo to pen his memoirs in “Tough Guy, Gentle Heart.” (Infinity Publishing, 2013). The book weighs in at a lithe 129 pages, similar to the stature of Millan; and like the play of the All-Star second baseman, is as much about perseverance as it is about baseball. The young Puerto Rican infielder came from extremely humble beginnings in his hometown of Yabucoa, where he attended school barefoot, dreaming of his daily dismissal so he could go and play baseball. Using a glove made from canvas stuffed with newspaper, Millan devoted countless hours to developing the soft hands that made him a Gold Glove infielder. As he grew in skill and size, Millan became widely known for his prowess on the diamond, enough that his high school English teacher let him sleep in class. She saw potential in Millan that would someday allow him to leave his town of Yabucoa. Upon graduating from high school, Millan joined the United States Army, where he tried to navigate his way through his commands armed with only a little English. Luckily for Millan, after a transfer to Fort Gordon, he made his way on to the baseball team and rode out the rest of his time in the Special Services. Waiting back for him in Puerto Rico was a young girl named Mercy, someone he only knew through trading letters in the mail. With Mercy by his side, Millan signed with the Kansas City Athletics in 1964 and blissfully entered the career he had envisioned ever since his elementary school days. His dream didn’t quite match up with the realities of the South in the early 1960s. Being a man of color who wasn’t fluent in English did not bode well for Millan during his rookie campaign in Daytona Beach. The harsh treatment he endured both on and off the field was enough for Millan to want to turn his back on the game he loved so dearly; that is until Mercy stepped in. With the encouragement of his wife, Millan chose to follow his faith and continue to pursue his career in baseball. Millan shares choice details about his baseball career from start to finish, starting in Puerto Rico, progressing to the major leagues with the Atlanta Braves and New York Mets, to his travels in Japan and Mexico at the end of his playing days. It is told in a way that does not turn his story into one of self-aggrandizement. Particularly touching is the story of how Hall of Famer Hank Aaron took the rookie under his wing when he was first called up to the Braves. Diehard baseball fans may find “Tough Guy, Gentle Heart,” a bit short on winding tales inside the lines; however, those gaps are neatly filled with the rich life experiences that helped to shape one of the sport’s finest gentleman.